The "Email" tab contains settings for the various email notifications that get sent out to users and administrators. These "General" email settings apply to all emails that get sent out. The "Template" controls the appearance of the email. By default you can choose our HTML template or plain text emails. The "Email Header" is a piece of text shown at the top of each email. This is optional. The "Email Logo" is an image to be displayed at the top of each email. This is optional. The "From Name" is the name associated with each email that gets sent. This should be your name or the name of your business. The "From Email" is the email address each email is sent from. If someone replies to a notification email, it will go to this address. The "Admin Notification Email" is where all admin notifications are sent to. Separate multiple emails with a comma. 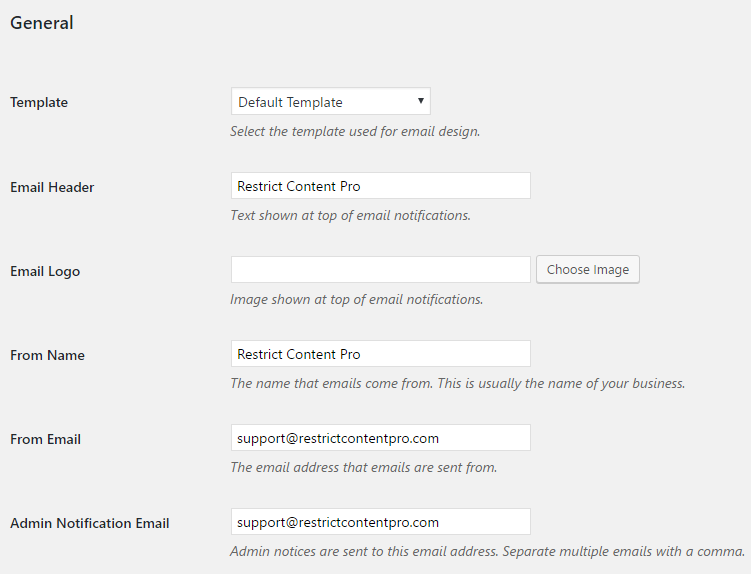 Restrict Content Pro has a list of template tags that can be used in each email. These template tags are placeholders for site, user, and subscription information. %blogname% - will be replaced with the name of your site. %username% - will be replaced with the user name of the person receiving the email. %useremail% - will be replaced with the email of the person receiving the email. %firstname% - will be replaced with the first name of the person receiving the email. %lastname% - will be replaced with the last name of the person receiving the email. %name% - will be replaced with the full name of the member (first and last name together). %displayname% - will be replaced with the display name of the person receiving the email. %expiration% - will be replaced with the expiration date of subscription. 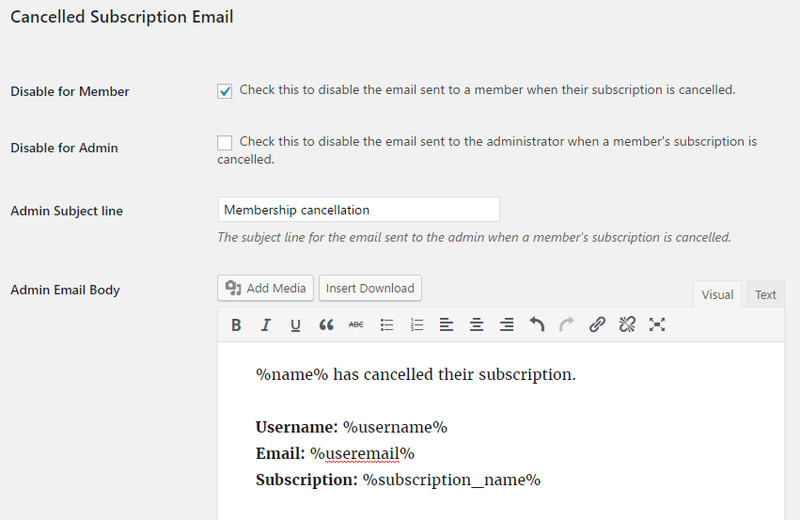 %subscription_name% - will be replaced with the name of the subscription. %subscription_key% - will be replaced with the unique, 32 character key created when the user is registered. %amount% - will be replaced with the amount of the users last payment. %member_id% - will be replaced with the user's ID number. %invoice_url% - will be replaced with the URL to the member's most recent invoice. In order for an email to be successfully sent, you must fill out the "Subject" and "Email Body". The "Disabled" checkbox must also be unchecked. If your email notifications still aren't being sent, read through the email troubleshooting article. Active Subscription Email - Sent when to a user when they sign up for their first subscription and their account becomes active. Cancelled Subscription Email - Sent to a user after their subscription is cancelled. Expired Subscription Email - Sent to a user when their subscription expires. Expiration Reminder Email - Notices that can be sent to a user to remind them of their upcoming subscription expiration. Renewal Reminder Email - Notices that can be sent to a user to remind them of their upcoming automatic renewal. Free Subscription Email - Sent to a user after they register for a free subscription level. A free subscription level has a price of 0 and a lifetime duration (it never expires). Trial Subscription Email - Sent to a user after they register for a free trial. A free trial is a free subscription level that has a fixed duration (i.e. 7 days). Payment Received - Sent to a user after a payment has been received from them. Renewal Payment Failed Email - Sent to recurring members if RCP is unable to take payment automatically (due to card expiration, etc.). Each email notification above has a separate subject and email box for the admin notification. If you'd like to receive an email when any of the above actions occur, make sure "Disable for Admin" is unchecked, and fill out the "Admin Subject Line" and "Admin Email Body" fields. The email will be sent to the "Admin Notification Email" entered in the general email settings. Admin notification emails can use the same template tags as the member emails.